This gourmet-inclusive beachfront resort for adults is luxuriously romantic, stretching along a secluded beach, and offers gourmet cuisine at 15 à la carte restaurants, hot tubs in every junior suite and a full-service spa. Relax in one of 6 pools or stroll along the beach. Extreme luxury and gracious, personal attention from the staff make this an ideal location for impromptu getaways, romantic weddings, honeymoons, and anniversaries. 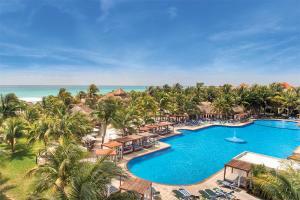 Located on Punta Brava Beach facing the beautiful Mexican Caribbean. 25 minutes south of Cancun's airport. Kampai - Featuring Oriental cuisine served - Á la carte. La Carreta - Featuring Mexican cuisine served a la carte. La Fontana - Featuring Italian cuisine served a la carte. La Isla - Features a la carte breakfast, a variety of snacks plus a la carte lunch and dinner. Jojo’s Caribbean Seaside Grill, Fuentes culinary Theatre, Rincon Mexicano , D’Italia, Cocotal Spot, D’Italia Casitas, Santa Fe Grill, La Cabaña Pizzeria, Health Bar, Las Olas, Kick.